China Phone – Karbonn Punch Out – Leaves Traditional Mobile Brands Reeling on the Ropes. Today similar and more advanced China Phones are threatening to forever change the game in the Indian Market. Karbonn is just one such brand, which is now sponsoring a One Day International Cricket Series being currently held in India. Nokia as the market leader perhaps has the most to lose. How they counter the threat at the bottom end is just as important as making their smart phone / mobile computer strategy work. 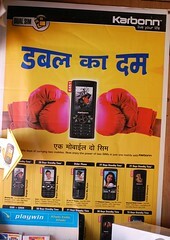 This is a Karbonn poster in a rural store – which has as its headline – “Double ka Dum” meaning Double Power/Punch. Similar ads fill the daily papers.